Andre Bernard Tippett was born December 27, 1959 in Birmingham, Alabama and grew up in Newark. He began studying karate as a teenager, which helped him focus, anticipate and move on the football field. Andre attended Barringer High School and became the star of coach Frank Verducci’s defense. His ferocious tackling helped the Blue Bears win the state title in 1975. Andre graduated in 1977 and spent a year at Ellsworth CC in Iowa Falls before joining the University of Iowa varsity in 1978. 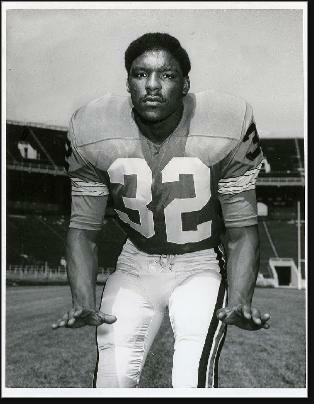 He earned letters in 1979, 80 and 81 and was named All-Big Ten as a senior captain in 1981. Andre was a consensus All-American linebacker that year, when the Hawkeyes won the conference title and played in the Rose Bowl. The Iowa D allowed two TDs or less in 8 of its 11 regular season games. The New England Patriots took Andre in the second round of the linebacker-rich 1982 NFL Draft. In all, 15 linebackers went in the first three rounds. The Pats were a team on the rise. They made the playoffs in Andre’s rookie year and won the AFC title in 1985, Andre’s second Pro Bowl season. His work as a run-stopping, pass-rushing linebacker keyed one of the league’s top defenses. Andre recorded 18.5 sacks in 1984 and 16.5 in 1985. The 35 sacks were highest by a linebacker in NFL history. Andre was named the AFC Linebacker of the Year three straight seasons starting in 1985 and UPI named him AFC Defensive Player of the Year in 1987. Andre received three more Pro Bowl nods, in 1986, 87 and 88. He was an All-Pro in 1985 and 1987. A shoulder injury in the last pre-season game caused him to sit out the entirety of 1989. Even so, he was named to the NFL’s All-Decade team of the 1980s. Andre retired after the 1993 season. He finished with an even 100 sacks for his career and also recovered 18 fumbles. He had one interception and scored two touchdowns.·He ranked seventh on the all-time sacks list, and third among linebackers, at the time of his retirement. Andre has an extensive martial arts background in Okinawan karate and holds the rank of 6th·degree Black Belt in·Uechi-Ryu·(Way-Chee-ROO) karate. He has a teaching certification and title of·Shihan (Master Instructor)·and is an advocate for men’s health. He also converted to Judaism, his wife Rhonda’s religion; his children were bar/bat mitzvah’d. Andre also serves as the executive director for the Patriots in Community Affairs. He was enshrined in Iowa’s Varsity Hall of Fame and named to the school’s all-time football team. In 2008, Andre was inducted into the Pro Football Hall of Fame. He entered the Jewish Sports Hall of Fame a year later. He is also a member of the Newark Athletic Hall of Fame.